So you’ve given it a lot of thought and you’ve decided you have found the person you want to marry, but how do you propose with a ring or with something else? 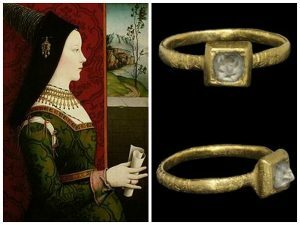 The earliest known example of a diamond engagement ring being used as a marriage proposal was in the year 1477, when the Arch Duke Maximilian of Vienna presented a diamond ring to Mary of Burgundy to symbolise their intent to marry. It wasn’t until the 19th century however that it became common for a man to present his future wife with an engagement ring. Previously, it was tradition to present the bride-to-be with a sewing thimble. Nowadays depending on the country, there are different traditions associated with getting engaged, for example if you lived in the United States, United Kingdom, Ireland, Canada, Australia, Italy, France, Sweden, Slovenia an engagement ring is generally worn on the left hand, this was because of the vein that travels directly to the heart from the ring finger. However in other countries such as, Greece, Russia, Spain, India, Colombia, Venezuela, and Poland it is most often worn on the right hand. In fact in Germany the brides change their engagement ring to their right hand once they are married, that definitely cuts down and matching your ring to the wedding band. In the Hindu tradition, women were commonly given toe rings called bichiya, as engagement rings. In West Bengal, women are given iron bangle bracelets, often plated in silver or gold. These untraditional engagement rings can be quite beautiful and ornately decorated, and are similar to the Western style of engagement ring. However today many Hindu men give their brides both, the traditional engagement ring and a Western-style ring. In some South American countries both the bride and groom-to-be wear engagement rings to signify their commitment to one another, like Brazil and Argentina. When Michael Bublé got engaged to Luisana Lupilato, he in fact wore an engagement ring saying that he had never heard of the tradition but did what he was told by his then future wife. David Beckham in fact had a matching engagement ring designed for himself when he proposed to his wife Victoria. This was perhaps done because he’s a fan of bling and not due to tradition. In North Korea in recent years, many young people have done away with giving expensive engagement rings and instead have opted to give their intended partner a smart phone! This is due to the fact that fewer people in North Korea have such items and they are seen as a sign of wealth. So instead of flashing a new diamond ring, if you live in North Korea you could be flashing a brand new phone. Whatever your personal choice is, whether you’d like an expensive rock, or a more subtle ring at Volatire Diamonds we have the perfect ring to suit your exact needs and tastes. This entry was posted in BlogHome, Engagement Rings London, Interesting Facts About Diamonds and tagged Arch Duke Maximilian of Vienna, bichiya, bling, Marriage.